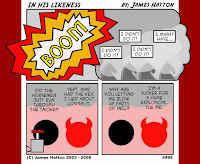 Just a quick note today to highlight that James Hatton's on the verge of his 500th episode of In His Likeness. (Episode #500 is due out tomorrow.) Although he's expressed some surprise/celebration/pride in reaching this milestone, I'm more impressed with how much he's done with so little. His main character, after all, is a black dot. Most of the supporting characters aren't much more elaborate. And yet, he does a fair job of animating them and providing a surprising amount of action and emotion. All of the characters have very distinct personalities and are immediately recognizable by their simple visuals. Whereas some comic book artists might have difficulty distinguishing their iterations of Ka-Zar and Kamandi, Hatton uses considerably less detail and still manages to make all the characters distinctly unique. While some might dismiss the comic for a lack of artistic merit, he's taken some of the notions laid down by Gary Larson -- that a funny comic doesn't need to be drawn especially well -- and amplified them to an almost Modrianic degree. Congrats to Hatton for his work on the strip, and here's to another 500 episodes! Thank you for the article & praise. It's more than appreciated. I'll keep doing what I'm doing if you keep doing what you are doing. Now I have to go look up all your damn scrabble words... stupid english.